Plus the pieces I'm loving right now. 1. How do you approach your layering and stacking? My philosophy on jewelry is "more is more," which I assume anyone can tell by taking one look at me. But it all has to do with your approach so you don&apos;t look like a joke when you walk out the door, just dripping in jewels. 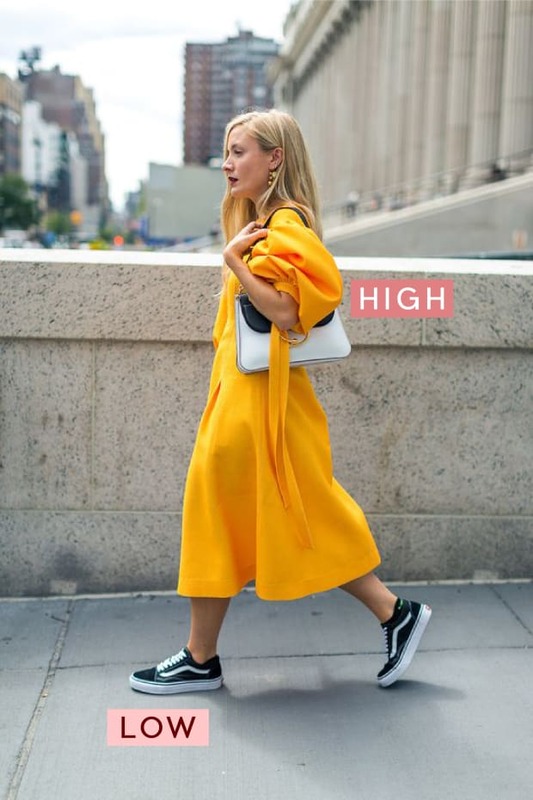 The goal should be to have it all look effortless and stylish without looking like you had to try too hard to achieve that look. Pay attention to things like proportion so that if you have one larger piece, say a bigger pendant, pair it with two thinner, daintier necklaces. Other things to consider: mixing new with vintage, fine jewelry with costume pieces, mixing metals and stones, flashy with dainty, and testing out to see how pieces will pair with others. Rings: For me, I rely on lots of daintier pieces that have special details - like my Sydney Evan &apos;love&apos; ring, my sweet emerald rings that I wear together, or my grandma&apos;s sapphire diamond on my pinky. They all tell a story and when layered together, it creates a lot of visual interest, and makes for a good conversation starter since people are always asking me about how I put it all together. Earrings: For my earrings, I currently have two piercings on my right ear and three on my left, with an additional cartilage piercing at the top. In my cartilage piercing, I currently have a single pave ball by The Last Line, which I love since it catches the light. Once that piercing finally heals, I&apos;ll probably swap it out for a barely-there little gold hoop since I love that look, but we&apos;ll see in about another six months (piercings. take. patience). In my third hole, I have a petite Maria Tash hoop with a little baguette diamond, which I always leave in. In the first two holes on both ears, that&apos;s where I mix it up. I try to pay attention to size and movement. So for example, if I&apos;m going to be wearing a hoop with a dangly chain moment in the first ear, I&apos;ll choose the opposite for the second - something closer to the ear that veers towards edgy instead of feminine, and that&apos;s a slightly smaller size so that they get gradually smaller. If I&apos;m wearing something more statement-y, like a large hoop or drop earring, I keep the other holes very minimal with a simple stud. Necklaces: When it comes to necklaces, I absolutely love the look of necklaces at different lengths "floating" on your neck. I&apos;ll usually have between one to three on at any given moment and they almost always include a graduated diamond necklace. G had gotten me a similar one years ago and since I&apos;ve gotten so many compliments on it, we started carrying them in the Shop. Bracelets: I stack bracelets on both wrists. On my left, I wear my grandfather&apos;s chainlink gold bracelet, which I never take off. It&apos;s my favorite thing I own and reminds me of him anytime I look at it. On that hand, I also have a thin gold bracelet that I had welded on in Paris with my best friend, Cristina. It&apos;s just a thin chain with a single star charm. It&apos;s exceedingly simple, but I love that it&apos;s claspless, so it&apos;s like we&apos;re wearing permanent friendship bracelets. On the other hand, I have a variety of vintage hand-me-downs from my mom and grandma, plus a rose gold tennis bracelet G got me for my birthday a few years back. I&apos;m not one who mixes metals much, but that&apos;s only because yellow gold is the most flattering on me. 2. What are your tips for avoiding tangles? 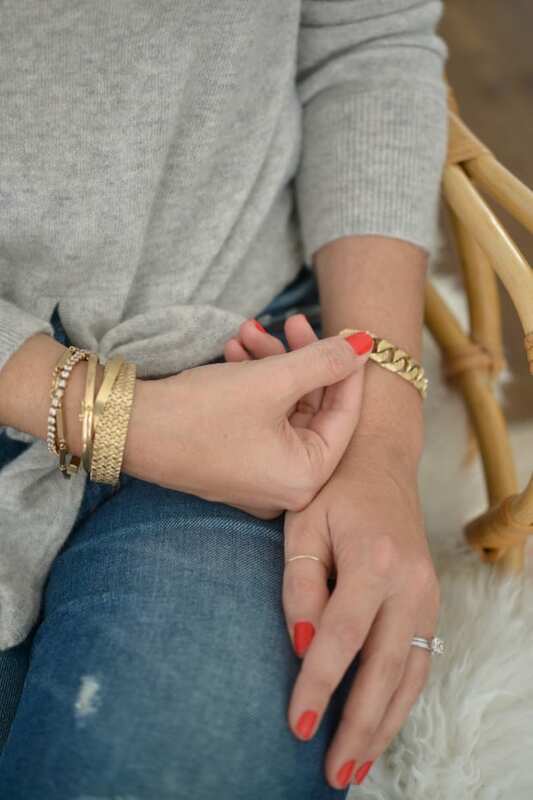 When I was younger, I wanted to open a &apos;jewelry untangling business.&apos; I saw just how frustrated my mom got anytime her pieces got knots and there seemed to be an untapped niche that needed to be filled. The problem was (and still is): I have very little patience and it requires a lot of hands on time. These days, my priorities have shifted a bit, and I&apos;m always looking for ways to avoid tangled necklaces in the first place. Outside of storing necklaces properly, in a box with individual compartments for necklaces, a proper travel case, or a necklace stand, I always try to wear necklaces that have chains with different lengths. I also recently learned a brilliant tip from Monica Wang, who shot our summer collection in Malibu last year. She advised: If you&apos;re wearing two necklaces, connect the clasp of necklace #1 to the O-ring of necklace #2 so that it becomes one long strand. Then, wrap the long necklace strand around your neck twice so it loops around. Connect the clasp of necklace #2 to the O-ring of necklace #1. You can use this technique for up to 3 necklaces! Alternatively, you can purchase an untangling clasp on Amazon that allows you to connect and space out up to three necklaces. 3. Do you ever take off your jewelry (to workout/shower/sleep)? I get asked this question more than just about anything else. I suppose since it would take me so long to remove and add everything back on, people wonder how I do it. Well, here&apos;s the deal: I never take things off. Besides the fact that I&apos;d never take the time to put things back on (see above for my lack of patience), I also never have to worry about misplacing things. Plus, my philosophy with jewelry is to wear the pieces you love. I think a lot of women have a tendency to "save" certain items for special occasions, but why not wear things every day if you love them? Even though a flashy piece may seem over-the-top for just a casual Tuesday, I actually think that&apos;s what makes things look the coolest: a striped tee with a diamond necklace is infinitely chicer than waiting until you have a fancy event.